National Azerbaijan foods are what people cook and eat in Azerbaijan. 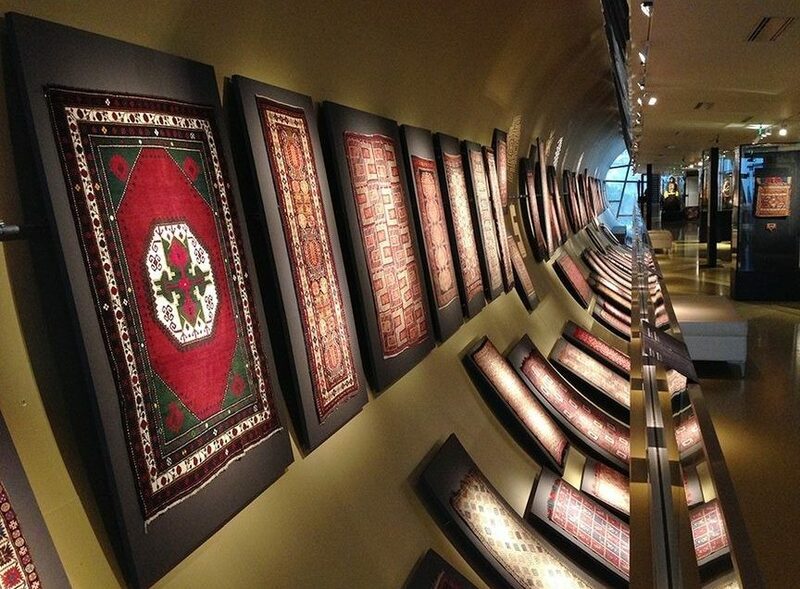 However, it remained different from foods in other countries. Many foods that people start to cook in Azerbaijan are now part of other cultures. For the Azerbaijanis, food is an important part of the country’s culture. There is no lack of recipes and ingredients in the cuisine of the Azerbaijani peoples: the country’s mountain and subtropical climate excellently provides them with everything to cook delicious and healthy food. Azerbaijanis cook food with beef and mutton, poultry and fish, fruit and vegetables. And of course with an indispensable addition of fresh greens, aromatic herbs, and spices. Azerbaijani cuisine is very substantial, nutritious and rich in calories, so it is often jokingly called “Male Food”. Firstly, a special Azerbaijani dish is pilaf – cook rice with saffron and enrich with meat or vegetable stuffing (shirin pilaf). There are also more unusual recipes of Azerbaijani pilaf – pilaf with milk, eggs or nuts, as well as Khan Pilaf, baked in dough. Azerbaijani pilaf differs with an original way of cooking and serving. They cook Rice and its stuffing separately and mix only when serving. It is with fragrant saffron, juicy kebab with sumac, buglama, and levengi – fish dishes, shekerbura mince pies for dessert, a table overladen with fresh fruits and vegetables. And near the end –sour-sweet sorbet as a soft drink. All these are various and original Azerbaijani Food. Another famous Azerbaijani food is juicy and flavored “Kabab”. 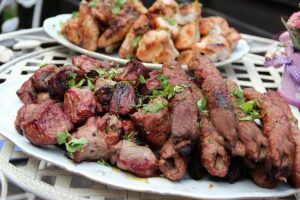 Azerbaijanis cook it with sour spice – sumac and prepared on the grill or in the tandoor. Kabab is special in Azerbaijan’s cuisine. You can try kebab in the numerous restaurants in Baku. However, we recommend that you try it in the province. 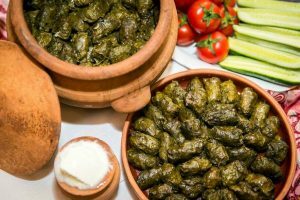 It usually means minced meat wrapped in grape leaves– this classic version is called “yarpag”. There are also other kinds of dolma when minced meat is stuffed in tomatoes, eggplant, and peppers. It is impossible to miss “Kutab” talking about Azerbaijani cuisine. People call it Azeri fast food. It’s a plain crescent-shaped thin dough patty with meat. Kutab is cooked on a dry hot skillet. People use butter, sumac spice for eating hot and ready Kutab. There is also a vegetarian version of this dish – a salmon, stuffed with spinach, coriander, fennel, pomegranate seeds and feta cheese. Also, Azerbaijani cuisine is rich in soups. For example, hot meat soup (piti), cold one with yogurt (dovga), with flour (umach), with ballotines (kyuftabozbash) and many other soups. Serve on The table is perfect with salads with fresh vegetables, greens and pickles as well as chorek and lavash as bread. Azerbaijanis, cook their foods in special utensils. 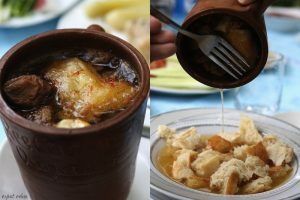 For example, they prepare piti soup in clay pots – PITI is Sheki’s signature dish. Pilaf – in special boilers with a thick bottom (kazan). Each Azerbaijani region has a “brand” food. They cook Chicken with nuts in the tandoor– in Lankaran. Kutaby and dyushbara – in Ashperon. And gyurza, similar to Russian dumplings – in Baku. The Azerbaijanis treat tea after a hearty meal with special love. The Azerbaijani sweet pastries include more than 30 varieties with poppy seeds, walnuts, almonds, sesame seeds, ginger, cardamom, etc. Among the most famous Azerbaijani sweets are baklava shekerbura, Baku kurabie. Every region of Azerbaijan has its own special recipe for baklava, it even has a different shape: classic baklava is diamond, famous Sheki one –square, while in Gabala district it is triangular and called “uchgulag”. 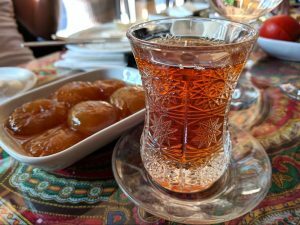 For tea, the Azerbaijanis usually serve jam, from watermelon, white dogwood, young walnuts. So, Azerbaijanis love to jam is so great. It is common to serve the sweet buffet with nuts, raisins, pressed sugar with different syrups. Azerbaijanis love to drink tea in a special type of glass cup – Armudu. and it keeps tea more time hot. PS. Do not be surprised if tea will be served before lunch – thus the Azerbaijani host expresses hospitality and cordiality to the guests.